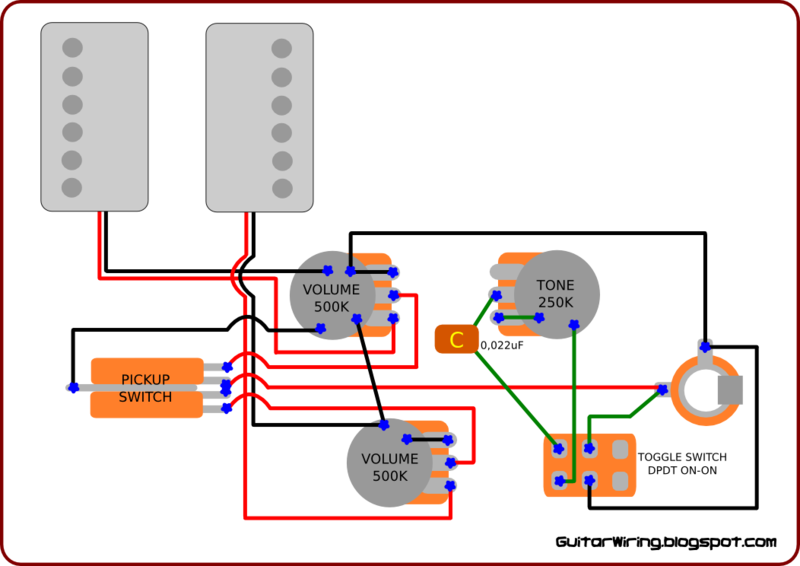 This is the guitar wiring that I designed for Les Paul, SG and also some hollow-body guitars users. The biggest change is in the tone control circuit. I swapped one of tone potentiometers, from 500K to 250K. I also took out the second tone pot and putted the mini toggle switch in his place. The tone switch is wired to be used to cut off the tone control circuit from the rest of the wiring. This function can give some more treble in the guitar sound, because disconnected tone control circuit (potentiometer and capacitor) will not affect the signal. Also the 500K volume pot will be working with a little bit different treble attenuation. The 250K tone potentiometer is mounted here instead of 500K, because 250k Ohm providing a more precise tone control. For example, 10% turn of the 500K pot will give 50K Ohm on a line (small turn – big change) - the same turn of 250K Ohm pot will give 25K Ohm (small turn – small change). The 250 is also making the guitar tone a little bit darker, but there is a toggle switch to cut it off from the wiring - when you will not want this characteristic.